So it is a Wednesday morning and middle of the week blahs are making it hard to think. Though two little people think we should be doing a craft. What to do? Then it hits me, it is Wonder Woman Wednesday! The wheels in my brain start turning and I remember a craft I did last summer with toilet paper rolls. Hero Cuffs! 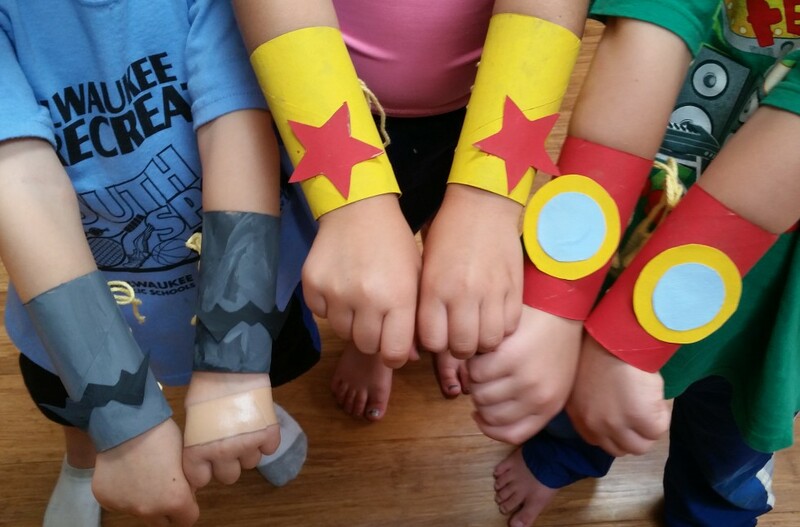 Wonder Woman Hero Wrist Cuffs sounds like a perfect Wednesday project. Last time I made this craft, it was with children that were four and older, so the kids painted the cardboard rolls and embellishments. We also used a hot glue gun to apply the add-ons. This time the little artists were three and under, so wanted to keep the craft simpler and not as messy. Decided making it more of just a paper and glue stick craft was a better option. Nice thing about this project is most things needed to make it can be found around the house. Step 1 – Cut each roll once lengthwise so that it can open and wrap around the child’s wrist. Step 2 – Sketch half of Wonder Woman’s symbol on a fold of piece of yellow paper. This way when the image is cut out it is the same on both sides. Then using a black colored pencil, pen, or marker, finish drawing the lines to complete the symbol. You will need 2 symbols, one for each cuff. Step 3 – Measure the length needed to cover half of the roll all the way around and then wrap around to the inside of the tube a little. Using this measurement, cut 2 red strips and 2 blue strips. Step 4 – Next cut 2 narrow yellow strips that will wrap around the entire roll and a little inside the roll. Once the yellow strips are cut, fold them in half and cut a peak at the folded end. Step 5 – Lay all the pieces out. Then apply glue and begin wrapping the red and blue strips. The red strip goes on the top half of the tube. The blue strip goes on the bottom half of the tube. Use tape to secure the paper to the inside of the roll. Step 6 – Apply glue to the yellow strip and place it on the tube so that it covers where the red and blue strips meet with the peak of the yellow strip pointed towards the red. Step 7 – Apply glue to the side of the Wonder Woman symbol that isn’t outlined and place it above the yellow peak on the red strip. The glue stars or apply stickers to the bottom blue strip. Step 8 – Repeat steps 5-7 on the 2nd empty roll. When both cuffs are complete, give them about 15 minutes to dry. Once they’re dry, fit a cuff over each of the child’s wrist and hero up! Because Independence Day was this week, I made a quick Captain America Hero Cuff too. Step 2 – Measure the length needed to cover the entire roll all the way around and a little bit inside the roll. Using this measurement, cut 1 blue strip. Step 3 – Next, cut circles to form the shield. Largest circle should be red, followed by a slightly smaller white circle, then a red circle smaller than the white one, and finally a blue circle smaller than the smaller red one. Two of each size circle are needed. Step 4 – Then glue the circles together to form the shield layers. First, glue the 1 white circle to 1 of the largest red circles. Next, glue 1 of the smaller red circles on top of the white circle just glued to the large red circle. Finally, glue 1 of the blue circles on top of the small red circle glued to the other circles. Step 5 – Glue a star or apply a star sticker to the center of the blue circle. Press hard to ensure all the circles and the star are stuck together. Step 6 – Apply glue to blue strip of paper. Then wrap it around the tube and fold excess paper over into the inside of the tube and tape it down. Step 7 – Glue the back of the shield symbol and place it in the front center of the tube on the blue. Press hard to ensure it sticks. Step 8 – Repeat steps 4-7 on the 2nd empty roll. When both cuffs are complete, give them about 15 minutes to dry. Once they’re dry, fit the cuffs over each of the child’s wrist and let the fun begin! Thanks! Hope you and your little one have fun creating your own.